Distinctive, sculpted yet highly interactive new music for two saxophones, bass and drums. "Hypnotic concepts that capture the imagination . . ." - All About Jazz. Featuring Luther Gray and James Lyden. Composer/Saxophonist/Educator Tim O'Dell has been called "...the composer of Chicago" (Beyond Coltrane) and ". . . a fine, new voice . . . loose and swinging and broadly expressive" (Cadence). Born in Oregon in 1966 and raised in the Midwest, Tim relocated to the East Coast in 2001 from the Chicago scene. In Chicago, O’Dell records for Southport Records and has performed at the Chicago Cultural Center, the Hot House, the Velvet Lounge and the Jazz Showcase with some of the city’s finest musicians. O’Dell’s three Southport CDs as a leader, Dreams of Pangaea - for jazz orchestra, Before My Life - for jazz sextet (featuring Tim on saxophones), and Ancient Pines - duets with bassist Tatsu Aoki; feature all original music by Tim, and have received glowing, national acclaim: "A perfect album" (Beyond Coltrane) and "Unexpectedly grand" (Chicago Sun Times). Another new CD, At War’s End, features Tim's unique saxophone improvisations with the creative gifts of Chicago bassist Tatsu Aoki and Boston drummer Luther Gray. “Quality of music is excellent . . . stunningly beautiful.” (All About Jazz/New York). 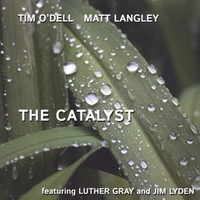 The Matt Langley/Tim O’Dell Quartet, a New England group that performs all original compositions by O’Dell and Langley, is soon to release their debut recording The Catalyst. Tim has also released several other nationally acclaimed albums and is currently composing music for his new ensemble - Pursuit - a New York City-centered 14 member ensemble dedicated to recording and performing Tim's, and co-leader Richard Nelson's, new, pan-stylistic compositions. “O’Dell designs hypnotic concepts that capture the imagination” (All About Jazz). A highly versatile, published composer, Tim O’Dell’s many dozen compositions cover genres ranging from string quartets to commissions for trombone ensemble to jazz chamber music to contemporary big band. Tim’s music has been broadcast worldwide and he has been invited to appear in Brazil, Japan, Switzerland, Portugal and Greece. “This is the sound of expanding American art” (All About Jazz). O'Dell has received more than $11,000 in arts grants by the Maine Arts Commission, Augustana College Research Foundation and Quad City Arts for his various projects and has commissioned and premiered many new works himself, including Gunther Schuller's Sonata for Alto Saxophone and Piano and Andy Laster's Valori Plastici, which Tim premiered in New York City. O’Dell is currently very active as a composer, bandleader and freelance saxophonist performing and recording with many ensembles. He has performed in New York, Miami, Boston, Chicago, throughout the Midwest and greater New England and been heard on Jazz Set, hosted by Branford Marsalis. An exceptionally versatile musician with extensive training in both classical and jazz idioms (see below), Tim has performed professionally in myriad genres - from symphony orchestras to Cuban bands to urban funk bands to classical chamber ensembles to (many) jazz bands. O'Dell has had the pleasure of performing with many renowned musicians (not mentioned above) such as Gunther Schuller, Danilo Perez, Kevin Norton, Ryan Shultz, George Russell, Mick Rossi, Wycliffe Gordon, Cuong Vu, Louis Bellson, Muhal Richard Abrams, Bill McHenry, Tim Hagans, the Aardvark Jazz Orchestra and The Temptations.“The saxophonist is great” (Cadence). Dr. O'Dell holds a Doctorate in Saxophone Performance and Pedagogy from the University of Iowa, a Master of Music degree with Honors in Jazz Studies/Composition from the New England Conservatory and a Bachelor of Music degree with Honors in Saxophone Performance with a Jazz Emphasis from the University of Iowa. Tim has studied composition with George Russell, William Thomas McKinley, Donald Martin Jenni and Jimmy Giuffre; and has studied saxophone with George Garzone, Paul Scea, Ronald Tyree and Kenneth Radnofsky. Since 2001, Dr. O’Dell has been on the music faculty at the University of Southern Maine and from 1993-2001 he was Assistant Professor of Music at Augustana College in Illinois. Prior to Augustana, Tim held graduate teaching assistantships in music at the New England Conservatory (Founder/Director of the Jazz Composer's Ensemble) and at the University of Iowa (Jazz Studies and Saxophone). "A thinking man's player and composer" (Jazz Times). Additionally, Tim is in demand as a clinician and adjudicator and maintains a thriving saxophone and composition studio out of his home in Brunswick, Maine where he lives with his wife and two sons. Saxophonist Matt Langley has been performing professionally for over 25 years. The product of an excellent Public School Music Program in the Concord, NH School District, Matt left high school well prepared to start performing immediately which he did with the experimental jazz group ESP. Landing a steady gig that lasted over two years, ESP was the proving ground for developing the improvisational style Matt still explores today. Along the way, Matt has also studied with Stan Strickland, Lou Marini and David Baker. As a longstanding member of the Charlie Kohlhase Quintet, Matt was involved in the recording of five critically acclaimed CD’s including the current (2003) double live CD on Boxholder records which showed up on a number of Jazz critics’ top ten lists. The CKQ has toured the US extensively, performing and teaching in venues ranging from grade schools to colleges and concert halls. Matt’s Discography also includes two CD’s with his own trio Color as well as recordings with the Mandala Octet, Carrie Coltrane, Tonkin Toys among others. Matt’s recording sessions have included an opportunity to play with one of the living legends of Jazz, Ron Carter. A native of Portland, Maine, bassist Jim Lyden has been performing for over 40 years. He has studied with both classical and jazz bassists. Much experience was gained early on playing with blues, funk, rock, and jazz groups in countless varied venues in Northern New England. A chameleon approach to each musical moment over the years has paved the way to a busy performing schedule. Freelance work as a sideman has led Jim to perform with many great local musicians as well as Bobby Watson, Tiger Okoshi, John LaPorta, Herb Pomeroy, Oliver Lake, Don Doane, and Curtis Clark, to name a few. He can be heard on several jazz and folk recordings. Jim currently performs with the Portland Jazz Orchestra. Drummer Luther Gray was born March 10, 1972. He started playing drums at 13 in punk rock bands. His musical training involved listening to records and taking drum lessons from Kim Martin, Larry Bright, Steve Bagby and Mickey Newman. In 1995 Gray graduated from the University of Miami with a Bachelor of Music degree after which he taught privately and performed in the Washington, D.C. area with, among others, Butch Warren, Cecil Payne, Webster Young, Tsunami, Liquorice, Peter Edelman, Jenny Toomey, Bob Butta, and Buck Hill. Since moving to Boston he has resumed teaching private drum lessons and has played with Joe Morris, Jay Hoggard, Joe McPhee, Timo Shanko, Cameron Brown, Allan Chase, Joseph Daly, Sabir Mateen, Roy Campbell, Ida, Geoff Farina, Rob Brown, Bill Lowe, Greg Abate, Raqib Hassan, Bill Pierce, Mitch Seidman, Steve Swell, Joe Beck, Ken Vandermark and many others. In addition to his performing schedule Luther teaches art and music at an after-school program for elementary school children.